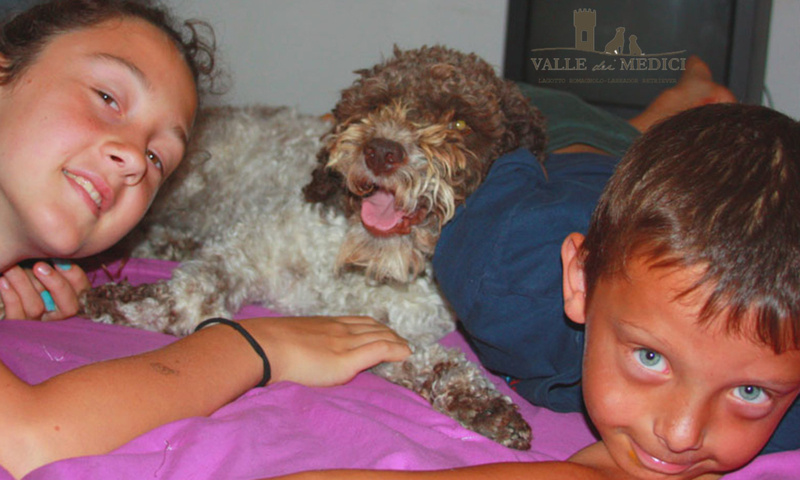 The color of the fur of the Lagotto Romagnolo goes from white to brown passing through the orange. The coat color can be: white, white to orange patches or to brown patches, orange, brown and finally brown roan. The brown roan is the result of a white pat of brown. It can take on more or less intense shades, almost as if it were grey. What about black? Black is not allowed by the breed standard. The color of the Lagotto Romagnolo as a puppy is never the color as an adult. A puppy with completely white hair from certainties. Except that then growing is likely to see some orange patches on the ears or chin.A puppy with an orange coat usually keeps its orange coat. Only a few changes of tone are very likely. The puppy with the Brown coat can keep it. More often it turns into a roan also light tending to gray. Most puppies are born white with brown patches. 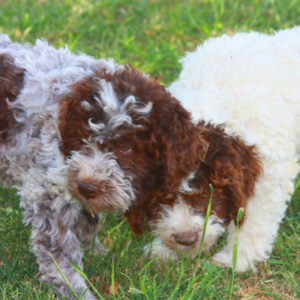 if we see pictures of litter of lagotto Romagna, we will see that many puppies are just like that, white to brown patches. The color of the Lagotto Romagnolo as an adult will be a roan, whose intensity also depends on the color of the parents. What I could notice is that puppies that are born with the nose and palms of the feet of pink color keep the coat white to brown patches..
Puppies that have the nose and palms of the feet of brown color from adults are roans. The puppies in the photo are already two months old and as an adult the one on the left has become a brown Lagotto Romagnolo roano. The rightmost puppy is a white and brown puppy with patches. From the image you can already see quite well how the color of the undercoat is already widely patted brown all over the body. At birth Rusty had a brown nose and palms on his feet. His not yet curly hair was completely white with patches. is the color of Lagotto Romagnolo puppy important? De Gustibus non disputandum est, our ancestors said. A phrase that aims to emphasize that it is nothing more than wasted time discussing people’s tastes. The Lagotto Romagnolo da Tartufo is generally preferred in white. They are easier to see in the woods and therefore can be better identified and managed. Those who choose a puppy from Lagotto Romagnolo are often influenced by the color to make the choice of the puppy even if the color of the coat will change with the growth of the puppy. However, we have seen what the possible changes are. Our certainty is that when your puppy becomes a member of the family he will be appreciated for other qualities, character and temperament in the first place. And he will be adored and pampered as he deserves. The color of the coat as an adult will always go well because it will be the color of our Lagotto Romagnolo.